Boxwood and Brass is an ensemble which specialises in playing 18th and early 19th century music for Harmonie ensemble, that (mainly) wind ensemble which is such a feature of continental European music of the period but which seems to have never quite made it in the same way in the UK. 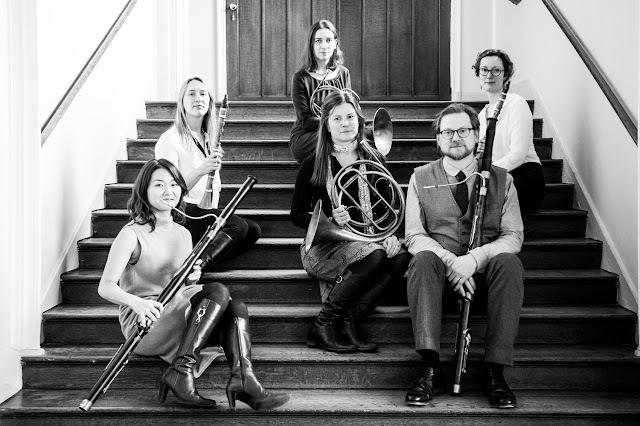 Boxwood and Brass has a core of players, Rachel Chaplin & Nicola Barbagli (oboes), Emily Worthington & Fiona Mitchell (clarinets), Anneke Scott & Kate Goldsmith (horns), Robert Percival & Takako Kunugi (bassoons), and Jacqueline Dossor (double bass). 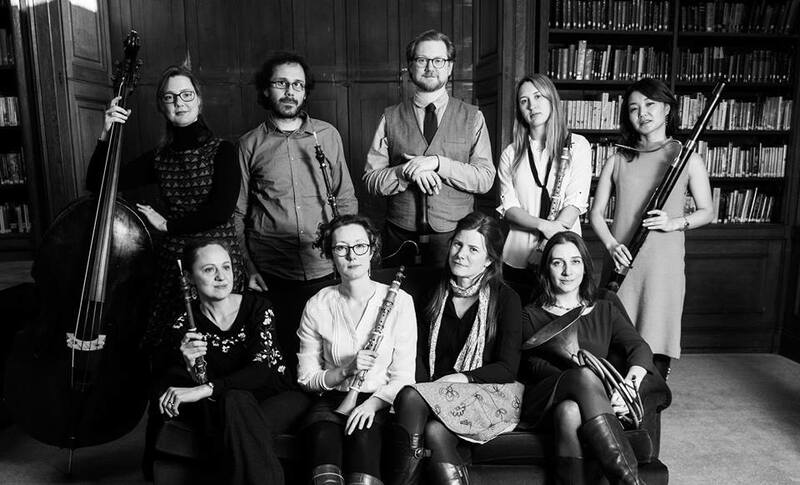 All perform on period instruments, and their programmes curate a mixture of original music, period arrangements and modern arrangements for the ensemble. I met up with two of the performers, clarinettist Emily Worthington and bassoonist Robert Percival to find out more. The group started out simply playing in people's living rooms, friends who wanted to try out the existing wind music on instruments of the period. Also, Robert Percival had done a number of arrangements and wanted to try them out. There is a lot of repertoire for six players (two oboes, two horns, two bassoons), though the repertoire for the larger ensembles (with the addition of two clarinets) has the greatest cachet nowadays, partly because this repertoire includes Mozart's Gran Partita. But it was the large range of music for six players which the group wanted to try this out. They gave their first concerts in Autumn 2013, basically because Emily said that they ought to do a concert! These first ones were small scale, as the group wanted to develop as an ensemble, to build a sense of ensemble in the same way you would a string quartet, with the aim of creating a well-grounded group. .
All the players are period specialists, though Emily mixes this with being a researcher and the other clarinettist, Fiona Mitchell, also plays in modern ensembles. They wanted the ensemble to be a specialist, period group and such highly trained period wind ensembles are more common outside the UK, and it is perhaps significant that the all group's members did some of their training outside the UK. Both Emily and Robert were keen to explain that playing in a Harmonie ensemble was rather different to both orchestral playing and chamber music which mixes a wind instrument with string quartet. Robert suggested that 'wind players are not allowed to play chamber music', with the exception of such pieces as the Mozart Clarinet Quintet, chamber music is nearly always taken to refer to music involving string players. For the players in Harmoniemusik the questions of timing, and balance come up, as the instruments tend to be paired (two oboes, two horns etc.) the aesthetics and practicalities are different to other music. 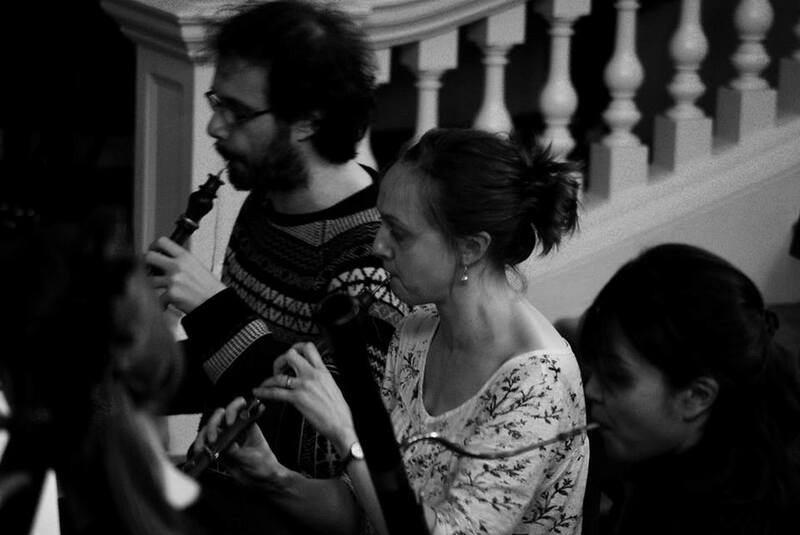 Robert and Emily both feel that the only way to really understand historical wind instruments is to play Harmoniemusik, because that is what the original players did. And the level of technical skill required is very high, very much like the demands of a concerto and some of the original arrangements are very difficult. Robert cites as an example the classic version of the overture to Mozart's Le nozze di Figaro where eight wind players have to fill in for an entire orchestra. So what is Harmoniemusik? In German the word still means wind band, but in the period 1760 to 1830 the word meant an ensemble comprising of pairs of instruments, two horns, one or two bassoons, two oboes and possibly two clarinets, with variations created by adding a flute, a double bass or contrabassoon, a serpent or a pair of basset horns. One group used to play with two oboes and two cor anglais, whilst another in Regensburg added two violas. This highlights one feature of the repertoire, its immense variation. Until 1800, music was produced locally in manuscript by the ensemble leader or members of the ensemble, so each group had a unique repertoire though it is clear that groups used to swap music too. In 1782 Emperor Joseph II formed an Imperial Harmonie octet, and this rather standardised things as it became the groups to have. Harmonie ensembles were popular with Bishops and with the nobility because they were more practical and economic than an orchestra, but after 1782 some members of the aristocracy had one simply because it was the fashion. 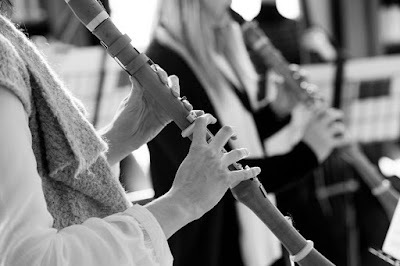 Generally, the wind players would be full time professionals, in the sense that we know it as someone making a living from their playing, whereas string players in the smaller courts would often be locals, liveried servants or retired wind players (!). Joseph II's ensemble had the Stadler brothers in it, so that Anton Stadler (for whom Mozart wrote his clarinet concerto) would have had a professional life not that dissimilar in structure to a modern wind player, playing in a Harmonie ensemble, playing in the opera orchestra and touring Mozart concertos. And this was not untypical, Robert feels. In the UK at the same period, the music economy as rather different and Harmonie ensembles were only familiar in a military context. It is this environment and background which Boxwood and Brass tries to evoke in its performances. Their programmes arise out of a mixture of research and serendipity. Their programme (subsequently recorded, see my review) Music from a Prussian Salon arose because they needed music for two clarinets, horn and bassoon (the available instruments for a particular occasion), and they bought five movements of XIII Pieces en Quatuor, Op.22 by Franz Tausch (1762-1817) and enjoyed them. Robert tracked all 13 movements down in a monastery in Switzerland which has a fine collection of early 19th century music. The rest of the programme was assembled around the idea of these pieces, combining music by Tausch with that of his pupils, Bernard Henrik Crusell and Heinrich Baerman, and his predecessor, Johann Stamitz. The members of the group enjoy reviving unusual and obscure things, but they also need programmes which they can sell to promoters. For their last tour, a promoter was interested in the arrangement of Beethoven's Seventh Symphony, and so the group paired this with music of the same period by lesser known composers Boildieu and Triebensee. Both Robert and Emily agree that they try not to simply play the six familiar pieces from the Harmoniemusik repertoire. But the people they need to convince are the promoters, audience members usually love the programmes. Robert has been producing arrangements of Mozart and Beethoven symphonies, so that the group has more interesting repertoire with a major composer's name. The aim of these new arrangements is to be historically appropriate, or to re-create arrangements which are known to have existed but which do not survive. Playing such arrangements brings a change of aesthetic for the players, and can help shed new light on their experiences playing the pieces in their orchestral guise. Robert and Emily also admit that it is fun for the players, they are in charge without a conductor and they get to experiment and take more risks. Boxwood and Brass is a very research led group. 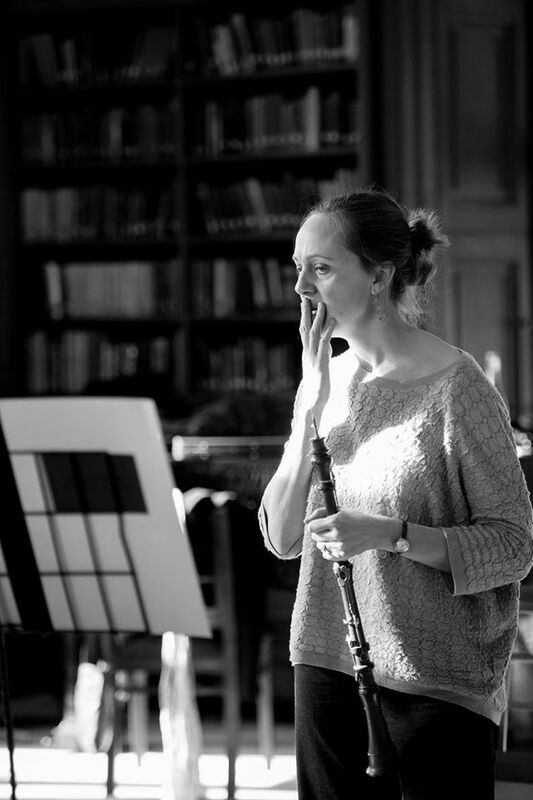 Emily works out of the Huddersfield Centre for Performance Research, and tries to bring ideas to the group, and one of the oboists, Rachel Chaplin, has a PhD in 18th century music. The advantage of a small group is that the players can do real performance practice research, something that would be tricky to fit into an orchestral rehearsal but which is easier with just eight players. For their last project they worked with a mentor who was a specialist in early 19th century violin playing, bringing new ideas about articulation from string playing which proved to work well with the wind instruments. Something they could only really find out by trying it. 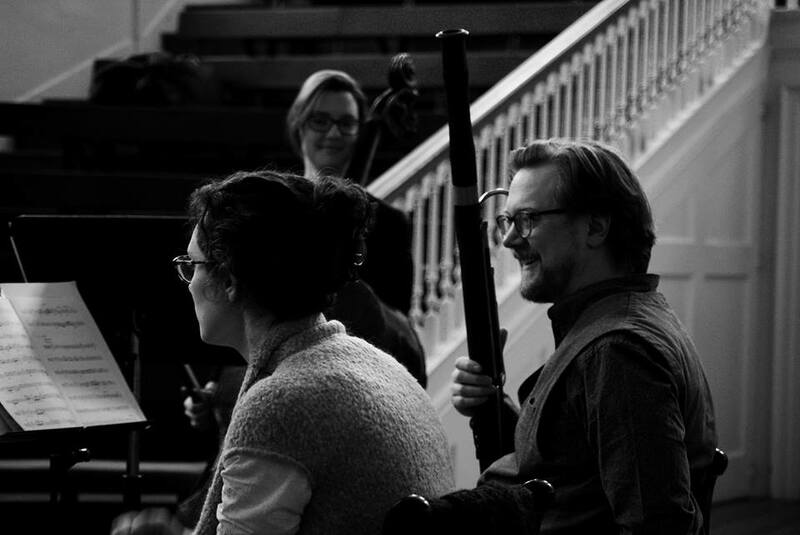 The group has some development days planned in April when they will be working on some of Robert's arrangements, and they are making 24 & 25 April open (further information from the ensemble's website). They are also hoping to launch a supporters group. On their recent tour, the performances of Beethoven's Symphony No. 7 went very well, and the group hopes that they might be able to record it. The arrangement of the Beethoven symphony is fascinating in its own right, a version for nine-part wind ensemble, it was published at the same time as the orchestral score of the symphony, by the same publisher. It is also not simply an arrangement; the number of bars is different, and the key relationships are different. The links to Beethoven are tantalising, it is clear he must have at least known about it. Robert also cites a wind arrangement of the Pathetique Sonata which is so different from the piano original that you wonder whether Beethoven was involved in some way. By playing Harmoniemusik the players come to understand not just how the instruments worked, but how the music culture worked too. In the late 18th and early 19th century the players of a Harmonie ensemble would flexibly move between providing 'background' music for events such as court ceremonial, balls, levées, drawing rooms and such, and giving concerts. Yet concerts during the period were lively, active affairs and probably were little different to the other court events. Our conversation continues, as we talk about the tantalising possibility of not just re-creating the sound of the era by trying to re-create the different performing situations. Something which is tricky, as in isn't just the instruments which have changed, our way of hearing and listening has changed to. Robert and Emily both have a way of mixing musicology and performance research in the most engaging way. This is something which comes over in their programmes, and it is clear from chatting to them that the ideas behind the group are anything but dry and that we have a number of intriguing projects to come.